I’m almost too embarrassed to list this light dessert as one of my recipes because i’m blatantly stealing it from Elise at Simply Recipes. However, gotta include it because absolutely everybody loves it, especially in a day when so many desserts are real rich and sickeningly sweet. Another advantage is that it contains no gluten and relatively few carbohydrates (for a dessert), my calculation being about 20 grams per generous slice. So it’s not real bad for you, and you can’t say that about many desserts. All i’ve done to the original recipe is increase the quantity by 50% so i can cook it in a larger pan (11 inch instead of 9 inch), make one minor ingredient substitution (lemon juice for vinegar), add a little lemon juice, and provide some guidance that makes it much easier to prepare. If you don’t want to follow my recipe, you can just click on that link above and use hers, where you can also find instructions on how to separate an egg, a caution against using a greasy bowl to beat the egg whites, and a much more tedious process. 6 eggs, separated and allowed to reach room temperature. 2 small lemons, totally zested. If you’re using large lemons, one would be enough. I use two little ones because they’re a much better buy. The main thing you’re after here is the zest since you need only three or four teaspoons of the juice. I have substituted successfully a couple of large limes. 2 1/4 cup finely ground almond meal or almond flour. I use the almond meal from Rodin Farms since they’re at the Castro Farmers’ Market on Wednesdays. For a variation, use hazelnut flour. 1 Preheat the oven to 350°F (175 °C). Mash into an 11-inch (28 cm.) springform pan a square of waxed paper large enough to completely cover the bottom and press the excess onto the sides of the pan. Butter the paper or give it a quick zap of cooking spray. I got this one a bit off center, but it still worked fine. I was out of waxed paper one time and just heavily buttered the pan, and the torte released without sticking, so the paper is just insurance. 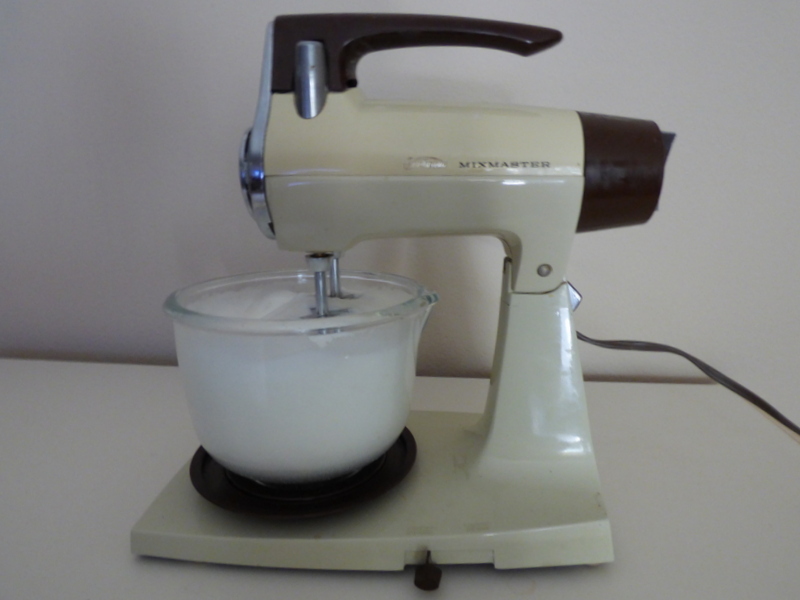 2 In the large bowl of your mother’s old Mixmaster that you confiscated after her death, use the dough hooks to beat the egg yolks, the lemon zest, and the sugar until smooth and creamy and has that fait le ruban look. 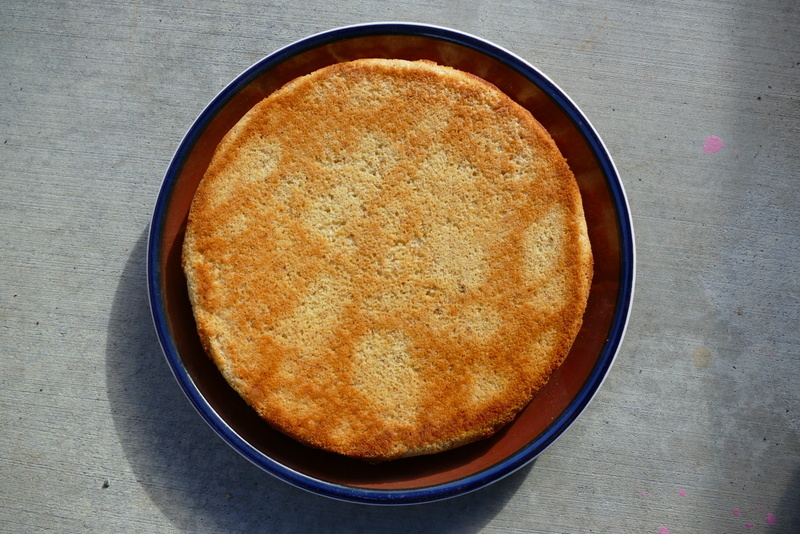 3 In a separate bowl, whisk together the almond flour, baking powder, and cardamom. Add the flour mixture to the egg yolk mixture. The mixture will be in big lumps bouncing around in the bowl. Then a few teaspoons lemon juice, just enough to get it to come together without becoming smooth. Be sure to save 1 t. lemon juice for the egg whites. 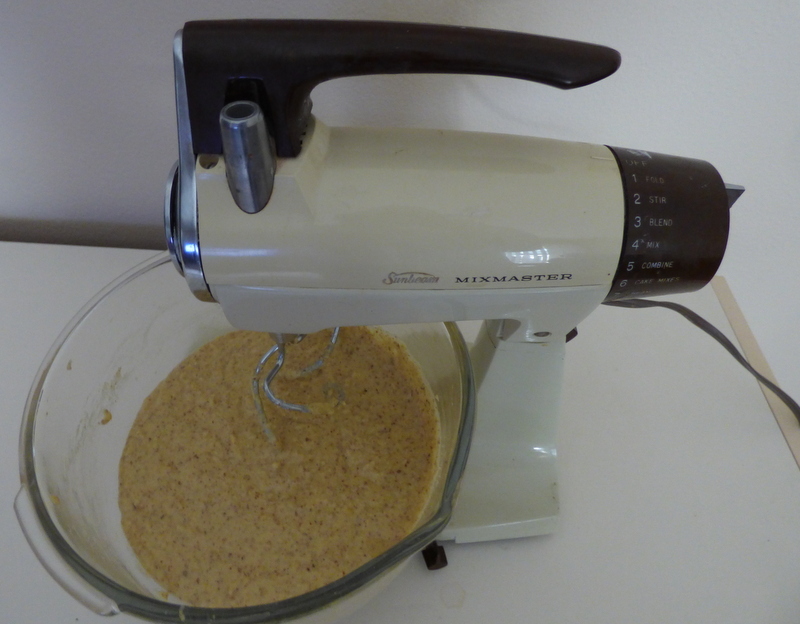 In the photo below, i could have done with a lot less lemon juice, so the batter turned out smooth. Even so, the torte turned out OK, so you have some latitude here. 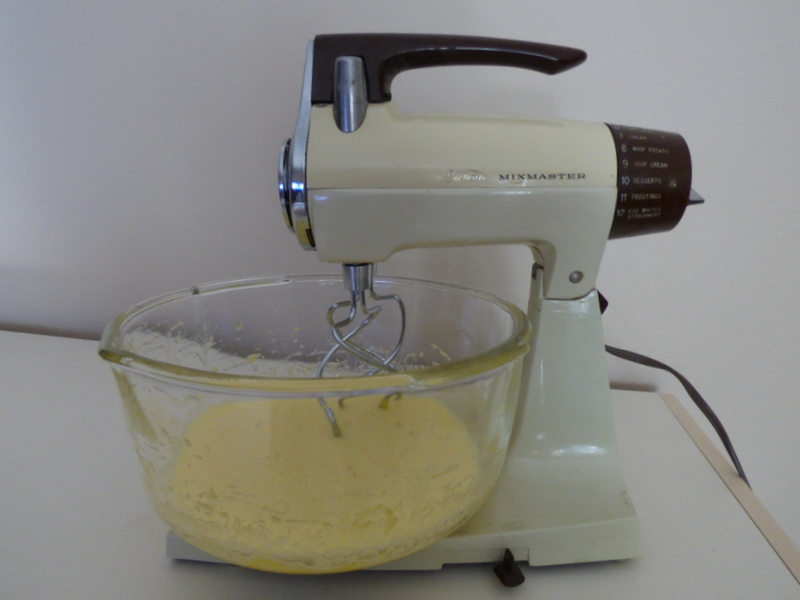 4 In the small Mixmaster bowl, use the regular beaters to beat the egg whites. When bubbles start to form, add the pinch of salt and the remaining 1 t. lemon juice to help the egg whites stiffen. Beat them until they’re quite stiff. Oh, and don’t panic, but six large egg whites whip up enough to completely fill the small Mixmaster bowl. Well, if they’re fresh. 5 Put the dough hooks back into the mixer and fold the beaten eggwhites into the almond mixture a large scoopful at a time at the lowest speed. The dough hooks let you gently fold in the whites to create a light batter, especially if you don’t just keep grinding away forever after the last of the whites is mixed in. 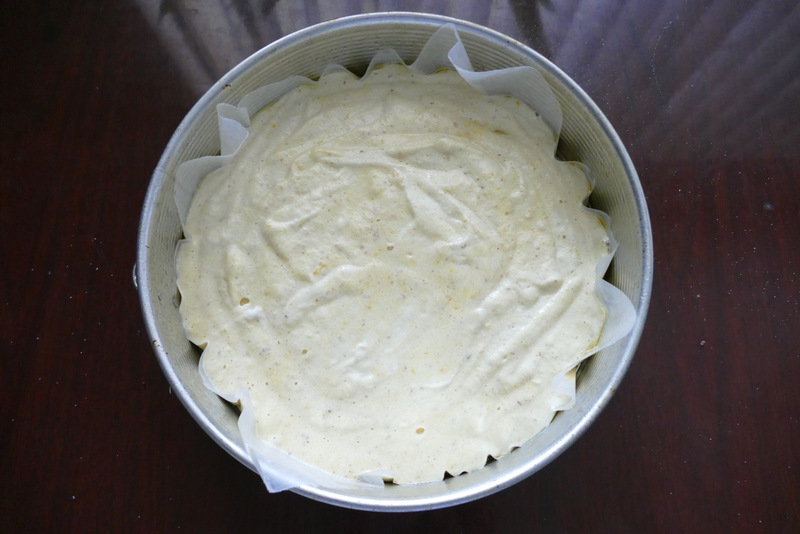 6 Scoop the batter into the prepared springform pan and place it in the oven on the top shelf. 7 Bake for 40 minutes or until the top is golden brown. Open the oven door and let cool. If you’re taking it somewhere, just leave it in the pan to protect it until you get there. 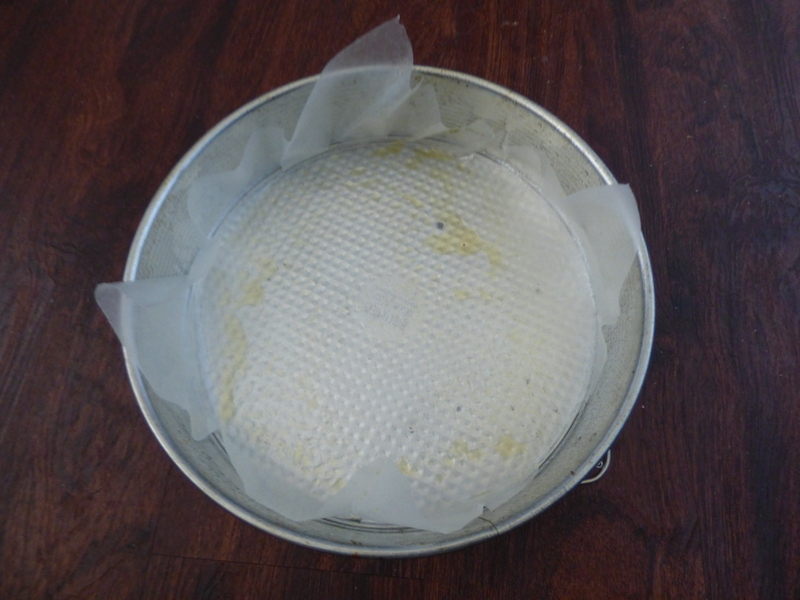 Otherwise, pop the ring loose, put the serving plate on top, and invert the torte. Remove the springform bottom and carefully peel off the paper. Voilà. You can turn this thing over to get a finer presentation, but be real careful as it’s quite fragile and won’t look nearly as good if it breaks into pieces while you’re messing around with it. 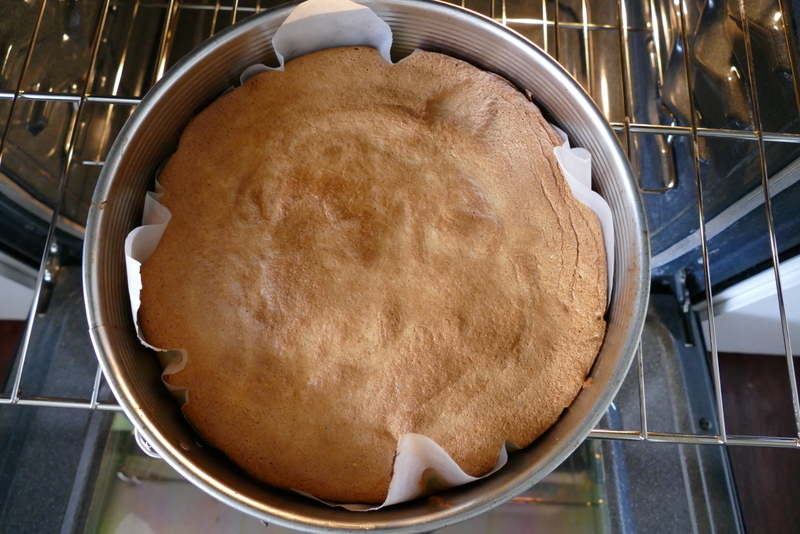 If you’re going to turn it over, the best way is to put a plate on top of the torte after it’s cool, invert the whole thing, peel the paper off, put the serving plate on top, and invert again. ta da. You can dust it lightly with powdered sugar or spread a thin smear of tayberry jelly over the top, but neither is necessary. An alternative is to just put a jar of berry jelly out and let the diners anoint their slices if and as desired. Note: Sunbeam Mixmasters were made in the United States until the early eighties, when the corporation that by then owned Sunbeam realized it could make more money by closing the American factories and offshoring the manufacturing to China. The fringe benefits were making a few of the 1% even richer, giving a big boost to our Chinese friends, and getting to fire all that union labor.